MetLife Foundation today announced the recipients of its 2012 Awards for Medical Research in Alzheimer’s Disease: Clifford R. Jack Jr., M.D., professor of Radiology and The Alexander Family Professor of Alzheimer’s Disease Research at Mayo Clinic (Rochester, MN), and Christine Van Broeckhoven, Ph.D. D.Sc., professor and department director of the VIB Department of Molecular Genetics at the University of Antwerp (Belgium). In addition, Randall J. Bateman, M.D., associate professor of Neurology at the Washington University School of Medicine in St. Louis, is recipient of MetLife Foundation’s Promising Investigator Award. 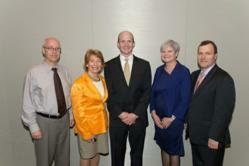 L-R: Dr. Clifford Jack, Gail Sheehy, Dr. Randall Bateman, Dr. Christine Van Broeckhoven, Dennis White. Doctors Jack, Van Broeckhoven and Bateman have made significant contributions to our understanding of Alzheimer’s disease and their dedication helps bring us closer to finding a cure for Alzheimer’s disease.